OK, the social media revolution is complete. I joined Twitter. I’ve been reading too many articles lately in which some newswire is relaying news – typically celebrity news – based on what the celebrity in question has just tweeted. So, I figure, why not use Twitter as the news source it has become? I do not ever intend to tweet (I’m already on Facebook, and I honestly can’t see a reason to be on both, unless I’m caught in a real life, hashtag-worthy event…). Rather, I plan to use Twitter as a kind of “Facebook of the Stars,” in which I can read about what various celebrities are telling the world without having to catch up on them through E! Online or Yahoo! Gossip or some other aggregator that has worked an exclamation point into their name. In terms of actual entertainment, I am fans of some of these folks and not of others, but they all looked like they might produce interesting tweets, which was my only criteria here (and thus concludes the story of how a Twitter user came to follow both Michael Moore and Sarah Palin on the same day. If only I had a way to share this exciting news with everyone I know. Oh yeah, that’s right: Facebook). It works. In the first fifteen minutes, I learned that Ellen Degeneres had sat down with a seven-year old paleontologist, that Justin Bieber has raised over $7 million for a clean water charity by asking his fans to donate to it in honor of his upcoming birthday, that Roger Ebert hated the Oscar telecast, that Kathy Griffin is going to appear on Glee, that Lea Michelle had pasta with Tom Hanks after the Oscars, that Matthew Morrison has a new single out (quick review: Yuck), that Britney Spears has a new single out (quick review: didn’t bother clicking the link), that Barack Obama will work with anybody! ANYBODY! to improve Health Care Reform, and that Seth Myers wrote a clever line about Charlie Sheen (“Post-Oscars, when I say “The King’s Speech,” I’m referring to stuff Charlie Sheen said.”). Not bad as a quick (and mindless) news source. In the time it took me to read 1,000 names and click on 59 of them, 13 people followed me. One is an “online dog community,” one is extremely profane, one describes herself (forgive me for assuming the gender here) as a “Justin Bieber fan.” All thirteen are total strangers to me and likely not even real people. Regardless, all thirteen will be significantly disapointed when they notice that I never tweet. Not even once just to try it. Ever. Seriously. Wikileaks releases new, “shocking” information every hour or so. I honestly didn’t realize just how shock-jock they were about their information. I haven’t removed them from the feed yet, but they’re the only ones I’m considering removing at this point. Go ahead – pick out your favorite, “Oh my, look at how old he/she looks!” person. Mine is Kelly McGillis, who is fifty-three years old, according to IMDB, but looks, to me anyway, like she’s in her sixties or seventies. I know – 100%, world-class cheese. But it still makes me smile. This story is strange on a wide variety of levels. But first, the facts: Pop singer, Katy Perry, recorded a segment for Sesame Street, in which she sang a (child-friendly) version of her hit song, Hot N Cold, with everybody’s favorite montser, Elmo. The segment was posted on Sesame Street’s YouTube channel as a “sneak peek” at the show’s season premiere. After more than one million views, the folks at the Sesame Workshop received a number of complaints that Ms. Perry’s outfit was too revealing, making it inappropriate for a TV show aimed at preschoolers. The Sesame Street folks decided not to air the segment on television and removed it from the Sesame Street YouTube channel, although they did allow it to remain on other YouTube channels and websites, including Katy Perry’s own YouTube channel and katyperry.com. 1) Sesame Street pre-releases clips of its shows on YouTube? Is this really such hotly anticipated content that we can’t wait for the actual show to air? 2) Parents actually watch pre-release clips of Sesame Street on the Internet? Are there folks out there who really want to pre-screen Sesame Street on a regular basis? 3) To Sesame Street’s target demographic, cleavage doesn’t suggest anything naughty – it suggests lunch! To be honest, I don’t very much care that they didn’t air it on television. One of the great things about the times we live in is that television isn’t our only source of media content. Anyone who wants to see Katy Perry sing with Elmo (or just ogle her cleavage) can do so on the Internet just as easily (or, some would argue, more easily) than on television. And if your two-year old is a big Katy Perry fan, you’re free to sit him/her down in front of the computer and let him/her watch. So the TV show becomes the “extremely safe zone.” That used to matter a lot, because the decisions of a select few affected the choices of the masses. Today, not so much. Pop quiz: what’s so interesting about this screen grab from Desperate Housewives? Answer: you’ve probably seen this newspaper before. Click here for more. 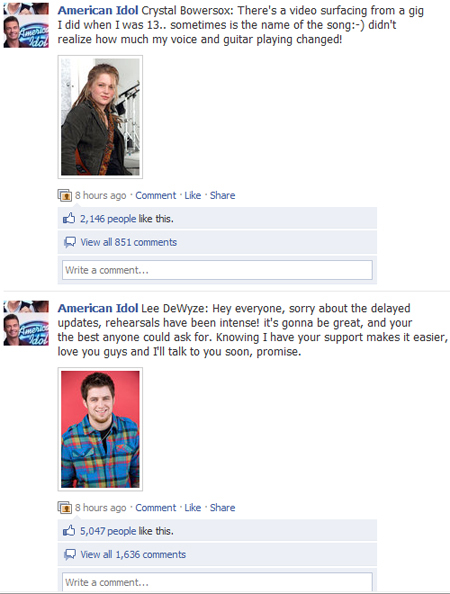 Crystal and Lee both posted status updates about eight hours ago. Note that Lee has more than twice as many “Likes” and more than twice as many comments. Assuming Facebook is a fairly random sample of American Idol viewers (isn’t basically everyone on Facebook at this point? ), I think we have our winner, folks. Oops – I guess I should have said ***SPOILER ALERT***, huh? Animal’s Secret Identity . . . Revealed! Interesting thing, though – I don’t think I’d ever heard Animal speak (other than one or two words at a time – between the screaming and the banging on the drums…). Now that I get a listen, though, I’ve come to a startling conclusion. My, what a difference five years makes, huh?